Chris has a Bsc. (Hons.) in Geography and has 32 years ‘practical and hands-on’ experience in E&P data and records management. He has worked and consulted to 24 oil companies and service providers (vendors). How did you get into the oil and gas industry and/or what attracted you to it? My first taste of oil and gas was whilst studying North Sea Studies as part of a geography degree. Being methodical, paying attention to detail and liking geography attracted me to the industry as a whole, and my first job was as a Data Librarian looking after well and seismic data at a storage and retrieval company, on behalf of several oil and gas exploration companies. I hold a Bachelor’s degree in Geography which covered modules such as Geology, North Sea Studies, Environmental Science and Statistics. 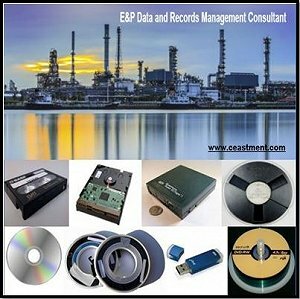 I have 32 years of practical experience in E&P data and records management. Twenty five years of this has been full-time, and the other seven years as a consultant. I’ve also worked for and consulted to 24 oil companies and service providers (known as vendors in the industry). Do you prefer to be hands on with Data Management or do you now prefer to pass your experience on and train more people coming through, especially when there is a skills shortage? I’m definitely a hands-on person so I prefer that. However, I have provided both formal and informal training to many individuals and companies (PESGB). I have ‘mentored’ many members of staff during my career. How has the exploration industry changed in the past ten years? The proliferation of digital data has been the biggest change in my arena. Also, with the evolving data-types, e.g. 3D/4D/OBC data, the transfer of data using HD media and online portals has also proliferated. Additionally, the use of National Data Repositories (NDRs) have grown and there have been numerous changes in legislation and obligations around data release. We have progressively moved on technology-wise from old style storage of tapes, etc. Do you think record and data management will, if it hasn’t already, move to the cloud or do you think this is too insecure? I don’t think this will happen at the moment. I think the cloud needs to be defined and be proven as secure before it’s used on a wide-scale for geo-technical and other sensitive records. Technically it’s feasible, but just because it’s available, it does not mean it’s the right solution. Geographically, are there any specific areas that are now of high interest and that were not even known of a few years ago? Yes, obviously shale gas has become prolific in recent years. Also deep water exploration, the deeper HP/HT reservoirs and heavy oil are now becoming more feasible. However, the high costs require high oil prices to stimulate this expensive exploration. Have you noticed any trends in the oil and gas sector over the past 20 years? Yes, particularly the growth of digital data in my arena. More generally, the demographics are leaning towards an older working population and replacing experience is now an issue. Staff redundancies, company mergers and R&D activity are on the increase when oil process fall. Reserves often get replaced by R&D activity rather than the drill-bit. Recently, various news channels have advised that the UK oil and gas industry was “close to collapse”. How true do you think this is, especially seeing that we have seen worse oil prices in previous decades; what is so different now? It’s a real issue for the UKCS. Low oil prices and high rig/seismic costs are a real issue. Also, the pools of oil and gas are getting smaller and harder to find and develop economically. However, there is a positive side, in that recent technologies are improving, as well as other activity. For instance, seismic acquisition and processing / imaging is now seeing through the salt; development and collection hubs may help make smaller finds more economic; there are improved production technologies; more advanced drilling techniques, horizontal and multi-lateral wells; faster data release and access to high quality data; the development of shale gas; political solutions to OPEC control, and the Sir Ian Wood review (MOR) and the development of the new OGA. Would you give any advice for young engineers who would like to get into the industry, either within data management or within that of exploration and production of oil and gas? Network, network, network! You must have a CV ready. Don’t be afraid to call up contacts and leads. GIS and Geomatics is the latest data management tool and, I think, more suited to a younger PC/IT literate generation. Hi, this is a great interview Chris. It was such a pleasure to meet you at the Petex exhibition at Excel. Good luck with your endeavours in 2015.